Tom and Liam opened for Northants with a tough fixture against 2 former England internationals in the shape of Liam Plant and Coby Cartwright. Not only are they former international players, but they were also playing on their home course and Liam is also head greenkeeper. Pretty much the worst possible draw! Tom and Liam got off to a slow start but did achieve a rare feat in winning a hole that their playing partners eagled. Liam Plant holed from 100 yards only to realise it wasn’t his ball. After our first friendly I feel his pain… Eventually Leicestershire prevailed 5&3. Fraser and Ryan were second out for Northants against Chris Abbott and Jack Malone. It would probably be fair to say Northants were basically out putted and that the score was a little harsh on the Overstone pair with the final score ending up at 4&3 to Leicestershire. Another late drop out through injury forced the captain in to action again and it made sense to play with Owen after a successful foursomes outing in the last friendly. We ended up playing their 2nd team captain John Fairbrother and Jack Merry. In much the same vain as the last outing Owen was very impressive, especially with his driver and I managed to play some nice iron shots when needed. We were always ahead and won 3&2 in the end, which was probably the worst we could have won by. Playing foursomes with Owen is very easy! 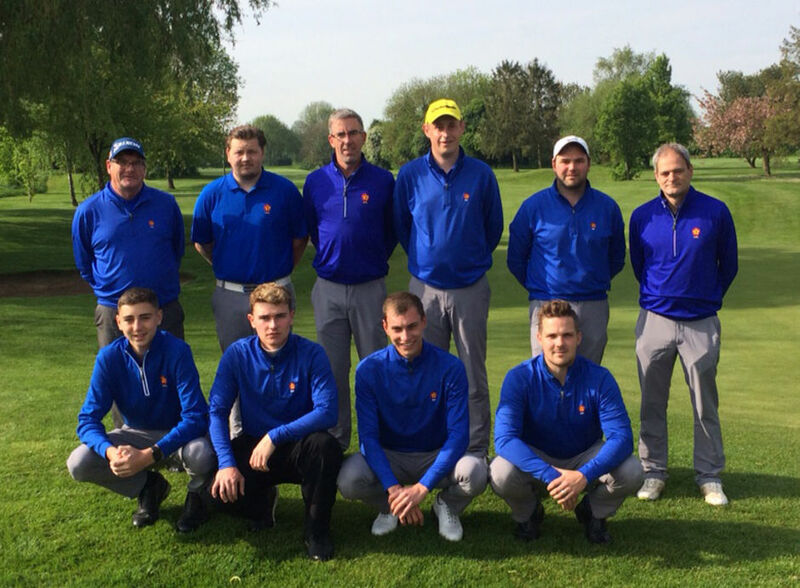 The last match saw James and Richard paired together against George Raitt and former captain Oliver Willson. It was one of those games which was close all the way round until the Leicestershire pair put a perfectly timed run together to win 4 holes in a row to win 4&3, including a near hole-in-one on the difficult 14th hole. I appreciate I have already used the term “a little harsh” and do sometimes feel it can be over used, but definitely in this case the score doesn’t tell the whole story. After the morning session we left ourselves with a mountain to climb and decided to change the order around to try and get the momentum back with us. This was a genuine management meeting including the captain, team manager, director of teams and one of the injured players and I think surprised one or two of the players. After another sterling display in the foursomes we decided to send Owen out top. We knew he would have a tough game and that he would be playing one of the home stars, but we also knew he wouldn’t be phased by it in the slightest. Owen continued his fine form from the morning and produced a scintillating performance filled with birdies to win his match 3&2 against Coby Cartwright. Just to put that into context, 15 year old Owen beat a former England player on his own course on his league debut! I think I was fairly full of praise for Owen in the friendly, but as league debuts go it really doesn’t get any better than that and I take my hat off to the young lad. James was promoted up the order to 2nd as his singles record over the years has been nothing short of sensational and he played Liam Plant. The game that ensued was of the highest calibre with James prevailing on the last hole to maintain his impressive record. Suddenly the match was tied overall and there was good news coming from all over the golf course. James got to join in with the excitement of seeing the game unfold having previously been so used to being relied on for the decisive point. Fraser played in game 3 against one of his morning opponents Chris Abbott and raced into a 3 hole lead very early on after a number of birdies and that cushioned remained until the 9th. The back 9 was a lot closer and the Leicestershire man started to chip away at the lead. Fraser continuously out drove his opponent and hit it closer than him more often than not, but in the end, the putter just wasn’t quite there and the game ended in a half. I played in game 4 and had the pleasure of Jack Malone’s company for the afternoon, who is probably one of the quickest players I have ever seen at county level. The game was a strange one with moments of brilliance from both of us, but with equal measures of total madness. As a foursomes partner I win more often that I lose but my singles record recently has been poor. To lose this match 1 down having putted so badly was difficult to take and in the end was a lot of the difference between the 2 sides. Previously my greatest strength is now my biggest weakness. I will enjoy watching the rest of the season from the side lines where I may actually be able to contribute to the singles. Tom contested game 5 against George Raitt and there was never more than 1 hole in it either way. Tom arrived at the narrow 17th hole 1 down and unfortunately drove out of bounds to end hope of turning the game around; a disappointing way to lose for Tom and moved Leicestershire perilously close to the winning tape. Liam played game 6 against Jack Merry and it was another closely fought contest. Liam was 1 down playing the last when his opponent looked for all the world that he had gone out of bounds. Liam changed down to an iron but also followed his opponent towards the trees, but not in any real danger of being OB. When we got up to the balls the Leicestershire ball was in bounds (just)and neither play could do much more than chip out. Having chipped out Liam played a lovely shot in to about 10 feet above the hole to heap the pressure on his opponent. His opponent duly missed the green leaving a rather difficult sloping putt down the hill from the fringe and he was unable to 2 putt, leaving Liam with the simple task of a lag putt and a decent half point. In game 7 Ryan played Oliver Willson whom he had played many times in the past and looked incredibly motivated as soon as he saw the team sheet. Ryan got 3 up early and was suddenly all square again around the turn. Having heard how close the game was overall Ryan found another gear to cruise away from his opponent and close out the game 3&2. So in true county golf style it all came down to the last game with Richard taking on their captain John Fairbrother. Richard had been all square or 1 up every time the score was reported, but in a similar fashion to the foursomes suddenly lost 2 holes and found himself dormie 2 down. His opponent gave us a glimmer of hope with an errant tee on 17, but it was so wide it ended up being ok and he played a really good shot in the green; after the whole game had been so delicately poised that iron shot felt a bit like a dagger to the heart. In reflection we played a very good team on a course packed with home advantage and we gave everything we had to give. The team spirit is really building and there is definitely a sense of the things to come. Seeing so many team mates and supporters willing you on is a special feeling and one which we all thrive on. So disappointed that we couldn’t quite get there, but equally proud of how hard we fought.